We're going to start this weekend a little early because I wanted to share Thursday night's dinner with you. And by "share" I mean link to the recipe. Unfortunately, C is not a fan of Italian food so I was very uneasy as to whether or not he liked it. Granted that wasn't going to stop me from making it for dinner since I was eager to try it. He absolutely loved it. He said it didn't taste like he thought it would (not sure what he meant by that) and even requested seconds (for the first time ever when consuming Italian food). Friday evening was a lot of running around. With my parents out of town C and I were on Mark and Dog duty all weekend. After work I went to Mark's scrimmage before taking him up to the Ohio District Senior High Youth Gathering in Dublin. Upon returning to Lancaster C and I went out to dinner at one of our favorite chain establishments in town. 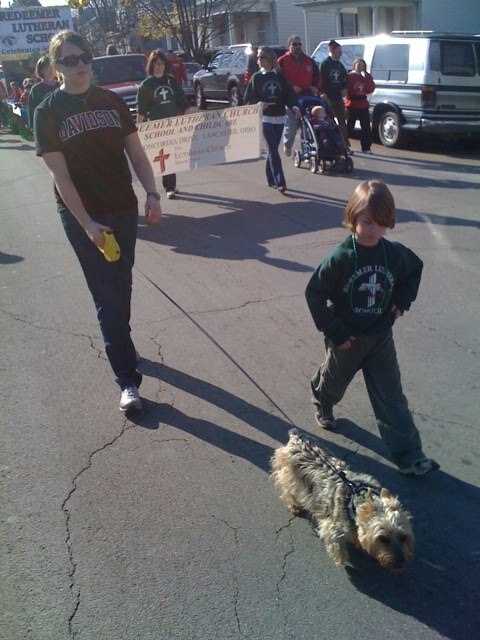 Saturday morning I went to let the dogs out and take Katie to walk in the Christmas, excuse me, Holiday Parade. While I walked with work, C took Katie to walk with church. She was the star of the show (aside from baby Jesus). After the parade we returned Katie to the house and ordered some pizza. At this point we we under the assumption that the Ohio State game started at 3:30. After picking up our pizza C ran into Walgreens to get a Coke and Mountain Dew. My theory - If you don't keep a supply at home, you can't drink it. The theory seems to be working and my pop consumption is going down. Anyway, back to Walgreens. While C was in there (at 12:15) he heard a football game on the radio. Turns out it started at noon and not 3:30 as we thought (and I say we b/c I never checked the time and trusted when C said it was). We did make it home in time to see the last half of the 1st quarter. However, I took a looooong nap through half time and the rest of the game. It's safe to say I didn't lose any sleep over worrying about a win. The rest of our Friday consisted of me spending the evening with Katie and Oreo while C worked. We met up again later for a Starbucks date. So far Sunday has been quite normal. Except for the fact that I ran to Target at 8:30 this morning to get a certain gaming system for Christmas and for the fact that I went to church alone. Not sure I can say I have ever done that before. Even when I was at Concordia I always seem to have someone to go with. Maybe I did go once or twice. However, I'm pretty confident I've never gone to Redeemer alone. If I even didn't have someone sitting in the pew with me, I always had dad upfront. After church I picked Mark up from his gathering. He seemed to have a great time and is very excited to get our youth group going again. Now we're just chilling in front of the t.v. watching our hometown "hero get some playing time. Tonight, once C gets home, we'll be going to BD's for his birthday dinner.